There are a growing number of students from the countries of UK, France, Germany and Canada continuing their studies of medicine or dentistry in the Eastern European country of Bulgaria. The students would meet regularly for Friday prayers, congregational prayers and would remain in constant contact with Bulgaria’s Ahmadi missionaries Jawad Uddin Sahib and Abdullah Sahib. The Khuddam would meet regularly for events like Musleh-e-Maud Day, the Promised Messiah Day, Khilafat Day and general meetings. In February 2018, the Khuddam studying in Bulgaria had the honour to meet with Hazrat Amirul Momineen, Khalifatul Masih Vaa. Huzooraa answered questions from Khuddam while also sharing his experience of what life was like as a student. Hazrat Khalifatul Masihaa graciously granted permission for the initiation of Majlis Khuddam-ul-Ahmadiyya Bulgaria on 4 December 2018 and appointed Hasseeb Ahmed Yaqub Lone Sahib as Sadr Khuddam-ul-Ahmadiyya Bulgaria. Sadr Sahib had the opportunity to meet Huzooraa to seek guidance for MKA Bulgaria in which Huzooraa graciously instructed the yearly theme to be set as Salat. 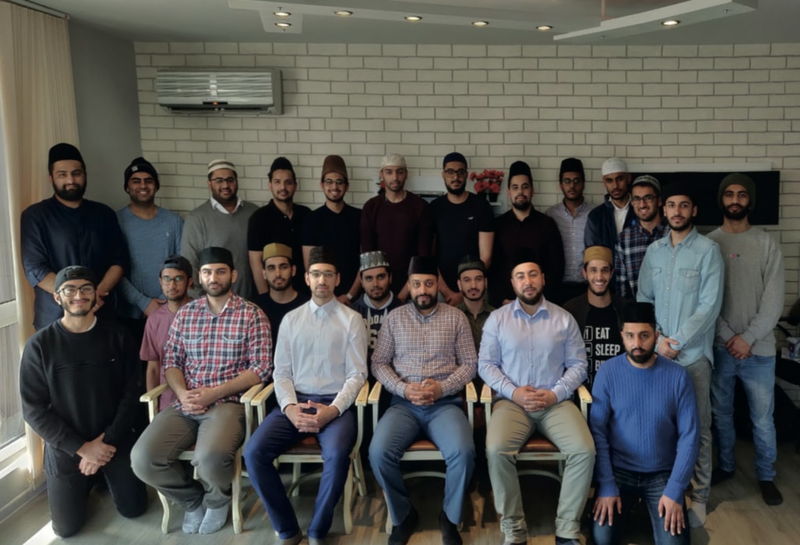 Huzooraa advised that the Khuddam should be praying all their daily prayers and that the Khuddam should form good friendships with good colleagues and neighbours. Huzooraa graciously approved the Amila list on 1 February 2019. Following the initiation of MKA Bulgaria, the first national general meeting was held on 9 March 2019 where Khuddam from across the country attended. The Khuddam in Bulgaria continually meet up for weekly Jumuah prayers and congregational Salat in each city. Musleh-e-Maud day was commemorated on 23 February in various cities throughout Bulgaria as well as the Promised Messiah Day day on 20, 23 and 24 March in the cities of Pleven, Plovdiv and Sofia respectively. Preparations for the first national Ijtema of MKA Bulgaria have begun and will Insha-Allah be taking place on Saturday 6 April in the city of Plovdiv (the European capital for culture in 2019 and the second largest city after Sofia, which is the capital of Bulgaria). We request readers to pray that Allah may enable the Khuddam of Bulgaria and by extension the whole world to act on the guidance received from our Beloved Imam, Hazrat Khalifatul Masihaa. May Allah enable us all to pray our five daily prayers on time with sincere devotion and allow us to become true servants of the Jamaat.